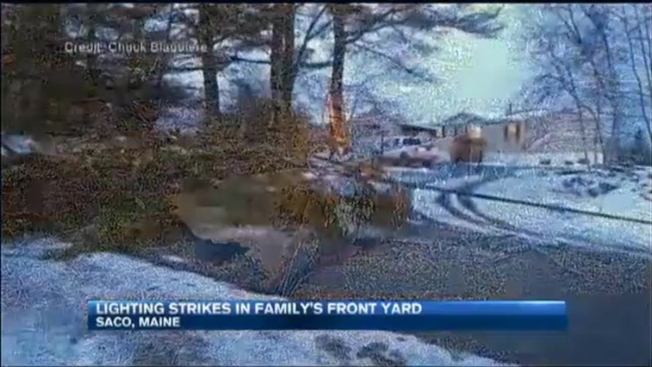 A rare February thunderstorm had a big impact in Maine Thursday, where lightning actually struck one family's yard. More than 10,000 power outages were reported between Emera and Central Maine Power customers. When the University of Maine at Orono campus lost power, school officials had to cancel classes. In Saco, a lightning strike caused a tree to explode in a yard on Jenkins Road. Neighbors said they heard what sounded like a bomb exploding, and felt their walls shake. Frank Freeman lives in the home where it happened. "If somebody had been in the yard for whatever reason at 4 in the morning, it could have killed them," said Freeman. Debris was scattered more than 50 yards away. Some parts of the tree hit the house and garage, breaking through a wall and a window. According to the National Weather Service, this is the first time in 17 years a severe thunderstorm alert was issued in Maine in February.